To initially pair the KeyMission 360 to Bluetooth® for the first time to an iPhone® or iPad® follow the below step-by-step instructions. Before pairing, make sure you have installed a fully charged battery and a microSD media card with sufficient free space. Also, make sure the airplane mode switch which can be found in the battery/media card compartment is set to the OFF position. Download the SnapBridge 360/170 app to your iPhone® or iPad®. Follow the pairing procedure below, connecting to Bluetooth® from within the app. You cannot connect to the camera from the smart device’s Bluetooth® setting screen. Step 3. Press the movie button or photo button on the camera, and hold until the green status lamps flash simultaneously then alternately. When that happens, the camera is in pairing standby mode. Note – the camera can remain in pairing standby mode for about 4 minutes and then it will turn off. If this happens, press the movie or photo button to turn it back on, so it will be put back into pairing standby mode. Step 4. Set your KeyMission 360 to the side and pick up your phone. Step 5. From the Connect screen, select the camera name when it automatically populates. Step 6. The next screen will also automatically populate with your KeyMission camera. Select your camera once it appears in the list. Step 7. You can either choose to continue as a guest or sign up for a Nikon ID. After you have done this, you will be taken back to the Connect tab. Step 8. You are now connected via Bluetooth®. The next thing you will see is this window, letting you know that you need to switch to a Wi-Fi connection to view and download movies from the camera. 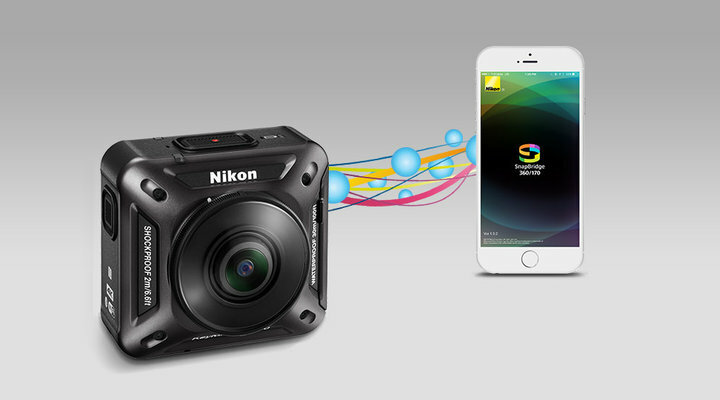 Click OK.
Now that the Bluetooth is paired, if you want to shoot remotely or download images via Wi-Fi®, you will need to pair the Wi-Fi® connection between the KeyMission 360 camera and the SnapBridge 360/170 app. Step 2. Select the camera icon on the smart device. Step 3. Click on the arrow next to Remote photography. Your smart device and KeyMission 360 are now connected via both Bluetooth® and Wi-Fi. You can shoot remotely from your smart device or download images and video to your smart device from the camera. You can also change settings on the camera via the SnapBridge 360/170 app. We recommend that you change the password to a personal one. To do so, within the app., go to: Camera Settings > Network Menu > Wi-FI > Network Settings. If you need to un-pair and re-pair your iPhone® or iPad® and the KeyMission 360 camera, read this article for detailed instructions on how to do so. Click here.